Participants share a laugh during a talk at the second archdiocesan Men’s Conference at St. Joseph’s Seminary, Dunwoodie, April 1. The conference offered four keynote speakers and confessions before closing with a Mass. Ryan Young, founder and director of a spiritual and leadership camp for Catholic teens, Camp Veritas, discussed the importance of the Eucharist. Father Jonathan Morris, pastor of Our Lady of Mount Carmel parish in the Bronx and a contributor to Fox News, encouraged the men’s involvement in their parishes and the archdiocese. Alfred Kelly Jr., CEO of Visa USA, shared a close-up look at his work serving as CEO of the 2014 NY/NJ Super Bowl Host Committee and chairman of the 2015 Papal Visit to New York City in his talk at the Men’s Conference. Ryan McGrath and Kevin Owens felt inspired to return to the archdiocese’s second Men’s Conference at St. Joseph’s Seminary in Yonkers April 1 after receiving a powerful message at the first conference in 2015. “It’s a great opportunity to take some time out of my life and reflect on my faith and strengthen my faith,” said McGrath, who, along with Owens, started a men’s group at St. John the Evangelist parish in Pawling after attending the first conference. The second Men’s Conference, which offered the opportunity for confession and closed with Mass, featured four keynote speakers. Ryan Young, founder and director of the spiritual camp for Catholic teens, Camp Veritas, discussed the Eucharist and its importance to the Catholic faith. Alfred Kelly, Jr., CEO for Visa USA, offered a behind-the-scenes look at his roles as CEO of the 2014 NY/NJ Super Bowl Host Committee and chairman of Pope Francis’ 2015 visit to New York City before talking about how his faith and prayer helps him. “Faith and prayer carried us in times when our daughter (Kaitlin) had cancer,” said Kelly, who was present to witness Kaitlin’s marriage to Sean Mara, grandson of late New York Giants owner Wellington Mara, in July 2016. Remarks about death and resurrection by Cardinal Dolan, who was one of the keynote speakers, were appropriate to the Lenten season. The day marked the 40th anniversary of his father Robert’s passing, and the Gospel reading at Masses that weekend showed Jesus raising Lazarus from the dead. 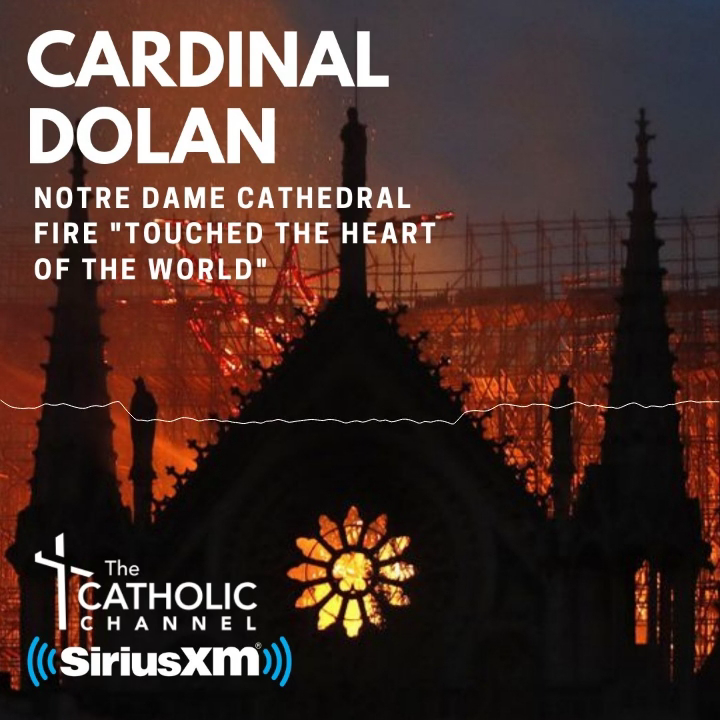 “For us, the dying and rising of Jesus did not just happen, it is happening because Jesus invites all of us to be incorporated into his dying and rising,” Cardinal Dolan said. The day’s final speaker, Father Jonathan Morris, pastor of Our Lady of Mount Carmel parish in the Bronx, said it is time to get out of our individual comfort zones, stop focusing solely on problems and lead with mercy to assist the Church. “I really liked Father Morris saying it’s each individual. Don’t complain about other people and rely on someone else to help the Church. You can do it yourself,” said Owens, who with McGrath and their fellow Knights of Columbus in Pawling raised money to send six children to Camp Veritas this summer. Hank Grimsland, director of Catholic Campus Ministry at SUNY New Paltz, attended the conference with four SUNY New Paltz students and one alumnus. “As campus minister, I want to be encouraged in the faith, but I also brought some students with me who are the next generation of the young Church,” Grimsland said. “I want them to be inspired and to deepen their relationship with Jesus Christ. Joe Lambrelli, a parishioner of Immaculate Conception and Assumption in Tuckahoe, recalled walking on the Fordham University campus at the first conference. The afternoon concluded with Mass celebrated by Auxiliary Bishop Gerald Walsh, vicar for clergy. Father Chris Argano, director of vocations for the archdiocese, preached an inspiring homily. “As men, our job is to reflect the fatherhood of God in our own lives,” Father Argano said. “Never doubt the importance of fatherhood that you share. Never doubt the importance you have in your families—how critical your role is to lead your wife, lead your children to greater holiness, to reflect in your life the father of God.